A “C card” is also known as a “license”. The official name of a “C card” is “certification card”. 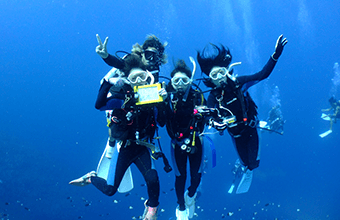 If you are the holder of a c card it means that you have successfully completed a diving educational institutions program. In the case of Reeffers our institution is through PADI. 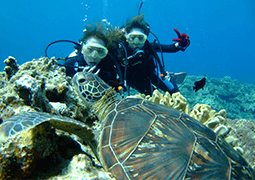 It also means that you have the necessary knowledge and experience in order to dive. 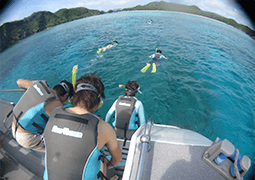 ※Practice dives of a boat is a separate cost of 8000 yen. Conditions of participation/ necessary items. Permission from a caregiver is required for minors. Application, confirmation of money transfer, delivery of study materials, self study at home. After arriving in Okinawa, knowledge development at either our shop or hotel. After pick up from your hotel we will head to the sea for a full day of practice. We will begin our practice in shallow water. 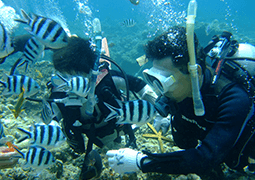 After completion, we will return to the shop for revision of diving knowledge and then return to the hotel. After pick up from your hotel we will head to the sea for another full day of practice. You have the option to practice in Kerama. 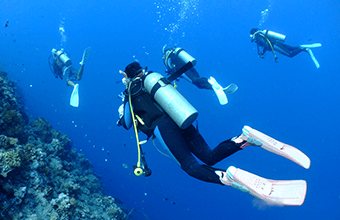 Once we finish we will return to our shop to complete the diver’s application form. 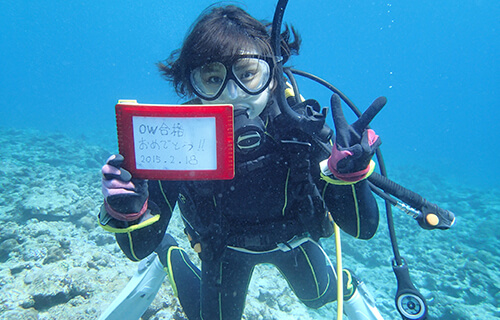 You now have your diver’s certification. CONGRATULATIONS! After completing the application form you will commence self-study on eLearning. 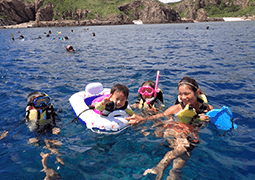 ・Due to sea conditions the schedule of the 2.5-day course mentioned may be changed. ・Due to the difficulty of the customer’s study pace there may be an increase in study material and added courses. ・Reservations must be made 10 days’ prior during our operating hours of 9am to 7pm. ・A pre-learning manual will be delivered to you. ・If you are ill or have had a serious illness before a doctor’s certificate will be required. 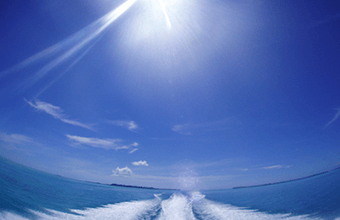 ・Due to bad weather or bad sea conditions the course may be cancelled. ・For customers who wear glasses, masks with special lenses can be arranged.